All we have left of the statue of King George III in Bowling Green is a painting. Historian Peter Feinman, who founded the Institute of History, Archaeology and Education, seeks to bring the wonder of these subjects to the public and he has dealt with the subject of Confederate and other recently reviled statues. Few know that there once was a beautiful statue of King George III in Manhattan that arrived from London on April 26, 1770. It was situated in Bowling Green at the southern tip of the island, Mr. Feinman wrote. 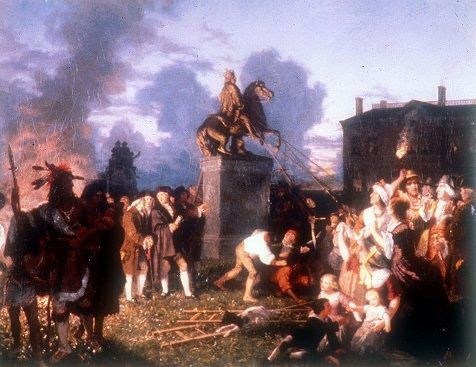 The statue, were it to exist today as an exemplary piece of art and history, tells the story of the American Revolution but a mob tore it down. Besides pulling down the statue of George III, patriots also knocked the ornamental finials from the posts of a wrought-iron fence that still encircles the Bowling Green. Much of the statue had been melted down into musket balls. New Yorkers should be outraged, if only they were, paying attention as Alan Schulkin, Democratic Commissioner of the NYC Board of Elections breaks down the extent of voter fraud in New York City. 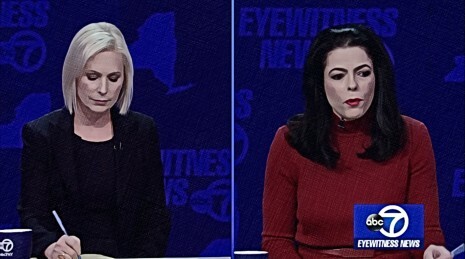 New York is run by a cesspool of bureaucrats on the state and local level who benefit from and are supportive of voter fraud, at the top of chain in Albany is Governor, Andrew Cuomo and on the local level Cuomo’s nemesis, Bill de Blasio. Retiring Republican N.Y. Congressman Crosses Party Line to Vote for Clinton. ≈ Comments Off on Retiring Republican N.Y. Congressman Crosses Party Line to Vote for Clinton. Congressman Richard Hanna (R-Barneveld) who represents New York’s 22nd Congressional District penned an op-ed in today’s Syracuse.com announcing that he will cross party lines this November to vote for Hillary Clinton. The retiring Progressive Republican was obviously waiting for the opportune moment to make it official. That moment came last week when the DNC’s Muslim prop, Khizir Khan’s attack on Donald Trump and Trump not one to bow to political correctness responded. To justify voting vote for Clinton, Hanna who voted for the Iran nuclear deal, trade deals and with Democrats (often) included Trump’s alleged verbal assault on John McCain, for good measure as if doing so would give this snake in the grass cover. Critical issues like tax reform, infrastructure, immigration, the environment and any future investments in people and assets are relegated to the opinions of the extremes of both parties. Electing Donald Trump will only make this worse, much worse. Months ago I publicly said I could never support Trump. My reasons were simple and personal. I found him profoundly offensive and narcissistic but as much as anything, a world-class panderer, anything but a leader. Little more than a changing mirror of those he speaks to. I never expect to agree with whoever is president, but at a minimum the president needs to consistently display those qualities I have preached to my two children: kindness, honesty, dignity, compassion and respect. Yeah, right. What did Hillary promise this schmuck? A seat in the U. S. Senate or a sanctuary city of his own? Political correctness, appeasement courtesy of New York City bureaucrats aka enablers of jihad will American blood on their hands…but then it is just “American blood,” right? Disgusting! When all else fails, John Kasich can at least say that he ate his way thru New York. Not really but I was wondering when the mainstream media would pick up that all John Kasich has done since arriving in New York is EAT. Okay, now that might be a fair assessment of Kasich’s New York visit nor is the title of the New York Times article that reads, “John Kasich’s Big New York Challenge: Saving Room for Dessert“ but if I see one more news report of Kasich in New York while he’s stuffing his face, I’ll throw my shoe at the television. Then I will really be pissed since I am not prepared to purchase a smart television. Nothing from nothing, where did they get that pizza. Suggestion and it is only my opinion, as a native New Yorker that to secure a good slice of pizza in NYC, one must venture down town to Little Italy, the outer boroughs or Long Island. What is often sold in areas frequented by tourists only “looks” like New York pizzas. Gov. John Kasich was ready for dessert. But first, he clarified his plan of attack. “I’m not going to eat my strudel with a knife,” he said. Mr. Kasich was finishing the latest stop of his culinary tour of New York, which has included pizza in Queens — where he used a fork, possibly on purpose — and an Italian feast at a deli on Arthur Avenue in the Bronx. For Saturday’s outing, three days before New York’s primaries, Mr. Kasich perched himself on a stool at the PJ Bernstein kosher-style deli on the Upper East Side of Manhattan. A swarm of journalists surrounded him, ready to document any misguided utensil usage. Mr. Kasich eagerly tackled a bowl of chicken soup with kreplach, a type of dumpling, declaring to anyone who wondered, “I love soup.” He used a spoon to eat the soup, as people tend to do. In a bold move, he turned away a pastrami sandwich, explaining that he planned to have dinner with one of his daughters upon returning to Ohio later Saturday….